It is only a matter of time before Manchester United announce Ole Gunnar Solskjaer as their new full-time manager. I think a deal was already in place and agreed before the stunning Champions League win in Paris but that incredible result will have confirmed it's the right decision. Solskjaer deserves the job. From the day he took the role he has said and done all the right things, allowed his players to play with freedom while underlining the importance to them of playing 'the Manchester United way'. Whatever he has brought, it has clearly worked, demonstrated by the amazing scenes in Paris on Wednesday. What a game. What a performance. What a manager. He is like a mini Alex Ferguson, saying and doing all the things like the great man. 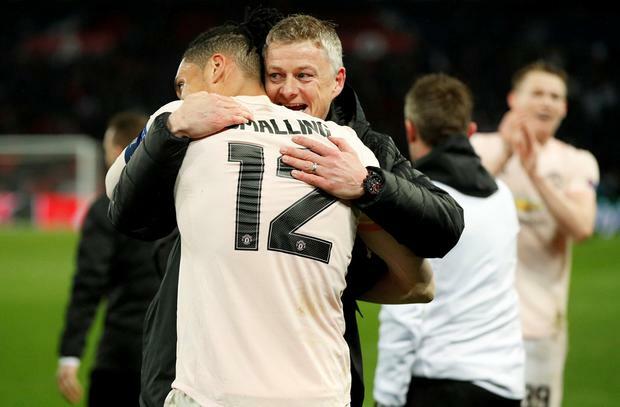 The biggest factor in United's favour on the night was the tactical bravery Solskjaer showed. Firstly, by using 4-4-2 from the start, which in the world of football these days means you are prepared to concede possession and not dominate the midfield. Solskjaer knew he could back his players in the two banks of four to be regimental and solid, while telling the front two to go out and get the goals. Then, to go 5-4-1 after the second goal, and for the team to buy into it and sit back until the last 10 minutes to then go out and win the game was another brave move. I am sure there were coaches throughout the world watching the game full of admiration for his approach and the changes he dared to make throughout. Many of them will have been thinking: 'I can see what you're trying to do there, and I like it, but there is no way I'd be prepared to risk it.' Fortunately for Manchester United, Solskjaer was prepared to gamble, and it certainly paid off. The transformation in certain United players under Solskjaer is incredible, but in the case of Romelu Lukaku, it has taken time. The Belgian striker dropped it into his post-match interviews that, when he took over, Solskjaer came up with a plan to get the best out of him. It needed something. After the World Cup, I said that I didn't think Lukaku was sharp enough and quick enough compared to the player who was burning down the wings in Russia. He turned back into that beast in the French capital on Wednesday night. Lukaku is all about pace, power and physicality, but Jose Mourinho wanted to turn him into Didier Drogba. That was never going to come off because Lukaku will never have the same attributes and strengths as the former Chelsea striker. His biggest asset is his pace, which is why the majority of his goals at Everton came from simply running through on goal. After the game, Lukaku admitted it had taken three or four weeks of work on his finishing and movement to get back to the levels he had reached in the summer, but he had stuck to and understood Solskjaer's plan. I don't think Mourinho was fully focused on the job and on the football when he went to Manchester United. There were too many distractions and bits and pieces off the pitch which he became embroiled in and I think he struggled to move north from London. The positive impact Solskjaer has had is in marked contrast to Unai Emery's first season at Arsenal. Have Arsenal improved since they delivered most fans' wishes and got rid of Arsene Wenger? No, I don't think so. They are still in the Europa League (just), still challenging for the top four, but they would have expected that at least under Wenger. Emery has still not found the right formula and bringing back Mesut Ozil says it all. He is searching for his best team, and I suspect his best team would include Aaron Ramsey, but he has been allowed to leave on a free transfer this summer. That is a really sad situation for Arsenal, and it must be especially galling to the club and the supporters to lose a player like Ramsey to a club like Juventus. The good news for the Premier League is that all the top six are still in Europe, ahead of Liverpool and Manchester City playing their Champions League second-leg ties this week. It is going to be a tough one for Jurgen Klopp going to Bayern Munich after the goalless draw at Anfield, but it would be great to see them survive. You could see any one of the four English clubs winning the Champions League, and Chelsea and Arsenal challenging all the way for the Europa League. Perhaps that shows that the Premier League really is as strong as the world viewing figures suggest.